The Palm Beach Research Group is an independent financial publishing company based in Delray Beach, Florida. It publishes various advisories that provide stock, options, and income recommendations—as well as non-market wealth-building advice—to more than 234,000 subscribers. When founders Mark Ford and Tom Dyson launched Palm Beach Research Group in 2011, they wanted to create a publishing company unlike any other. Most financial advisories are little more than stock “tip sheets.” Mark and Tom had a different vision for their company. They wanted to provide subscribers a comprehensive wealth-building plan; one that would guide readers along the path to real, sustained financial prosperity. To this end, Mark and Tom focused the Palm Beach Research Group on three key areas… safe income, safe growth, and comprehensive 360-degree wealth building. Specifically, they’ve combined Tom’s experience in the financial markets with Mark’s success as a serial entrepreneur and real estate investor to achieve their goal—a holistic, wealth-building publishing company. The Palm Beach Letter is our flagship investment advisory. It’s based on proven wealth-building strategies of New York Times best-selling author and multimillionaire entrepreneur Mark Ford, and the financial market expertise of Tom Dyson. This advisory teaches you how to generate new streams of active income, then invest it wisely using low-risk strategies to build and sustain your wealth. Each month, a team of analysts recommends the safest and most profitable investment ideas in the world under one single rule: Never lose money. Meanwhile, as you invest in the markets, Mark will show you “outside-the-market” wealth building strategies through his own complementary essay series called, Creating Wealth. Income for Life Premium is a unique strategy that teaches readers about a specific type of whole life insurance contract. Income for Life offers a safe harbor for your cash that grows at guaranteed rates up to 5% each year. While your cash grows, you’ll learn how to use policy loans… one of the most powerful components of this strategy. This program includes monthly webinars, essays, and training tools to teach readers exactly how to set these accounts up the right way. It also includes webinars highlighting how to finance your cars, house, college expenses or investments through Income for Life. You’ll never have to deal with a bank again. Extra Income Project is an entrepreneurial essay series, co-authored by New York Times best-selling author and multimillionaire Mark Ford, and professional freelance copywriter and direct marketing specialist Bob Bly. Mark and Bob show you how to generate extra cash—as much as $50-500 per hour or more—through 24 different entrepreneurial activities outside the stock market. Each income project requires as little as one hour per day—and you can do it all from the comfort of your own home. There are no special, pre-existing skills required. With the Extra Income Project, readers receive a monthly essay and a 30-day “launch protocol.” The opportunities include such ideas as: The Secret to Turning Your Favorite Hobby into an Extra $4,000 per Month; How My Golf Buddies Make $75,000 Per Year In Rental Real Estate Without Investing a Nickel; and Know Something About Anything? How to Earn $9,800 By Talking About It. If you need to generate additional income fast, this is the program for you. In the Palm Beach Income Trading Advisory, Tom and his analysts provide options trade recommendations. These trades generate average annualized returns of roughly 14%. Our service walks you through new recommended trades, providing you all necessary details and analyses. Tom and his team explicitly guide you every step of the way from the trade’s open to its close. To date, we’ve successfully profited from 97% of our recommended trades since launching the service. The Palm Beach Income Educational Course teaches subscribers one of the best, safest ways to earn income from the options market. It begins with a six-part webinar series consisting of lessons, trade simulations, downloadable supplements, and homework assignments. It wraps up with a post-course exam that prepares you to trade live. We designed the course to give beginners the knowledge and skills to trade options with confidence. This course is included with the Palm Beach Income Trading Advisory. C.A.P. Cash Flow is a “masters” level rental real estate course taught by expert Justin Ford. Even if you have no prior real estate experience, this program will you teach you how to add six (or even seven) figures to your portfolio and thousands of dollars in passive income every month. C.A.P. consists of six live training webinars with Justin, rare access to Justin’s actual projects, and a multitude of lecture material, sample documents, and contracts. The Wealth Builders Club is a service for the “not yet wealthy.” We created it so subscribers could learn step-by-step—alongside multi-millionaire Mark Ford—how to become wealthy in fewer than seven years. The Club features multiple essay series and programs, including: The Extra Income Project, a unique program designed to help you create a second or third income stream through 24 easy-to-do opportunities; Rental Real Estate 101, an introductory course in real estate investing; Retire Next Year, a guideline for how to retire in paradise for far less than you’d ever expect; How to Start a Million-Dollar Business for $25,000, which are Mark’s best ideas on entrepreneurship from more than 2,500 essays and his six best-selling books; and Living Rich/Rich Mind, which explores how to “live richly” on the income you already have. Combined, it is the most comprehensive wealth-building program in the world. The Legacy Portfolio is the safest, highest-yielding investment service we offer at the Palm Beach Research Group. It consists of over a dozen blue chip stocks—each one thoroughly vetted and established as one of the strongest, safest, most elite companies in the world. This long-term investment strategy is the easiest way for you to accumulate huge returns over the years—potentially millions of dollars in time for retirement. Our proprietary Accelerated Accumulation Technique (for dividend reinvestment) further amplifies your long-term returns. We built this service with one goal in mind: to provide you a way to generate a “legacy” of wealth, either for retirement or for passing along to your loved ones. Palm Beach Confidential is a subscription service in which we share picks that have the same criteria as other Palm Beach Research Group publications, but focus on smaller companies to generate higher returns. Most of these companies have market caps of less than $1 billion. For this reason, PBRG Co-founder Tom Dyson and Editor Teeka Tiwari previously reserved these plays for their family and closest friends. But with the creation of Palm Beach Confidential, and thanks to its limited membership, we can now deliver these plays to you. In other words, you can now consider yourself part of our “inner circle” and one of our confidantes. Each service supports the central mission of the Palm Beach Research Group: Help Readers Get Richer Every Year. Good research, but overhyped, pushy marketing, riding on cryptocurrency gains that were available to anyone. Advice is there. If you are wealthy already, The program is worthwhile I suppose. I am not wealthy enough to be able to invest in the programs that they talk about. The only thing this program verifies to me is that “it takes (a lot) of money to make money.” The average citizen in America probably cannot afford to do anything with this advice. There may be some good advice here, but subscribers are bombarded with several emails and videos a day, all promising some unbeatable deal only to be led to a promotion for yet another product or service. Customer service was polite and efficient when I phoned. Lately, the editors have begun to mix politics with financial discussions. They seem to have forgotten they are on a financial site, not a social media blog. When they finally descended into demonizing their political opponents they lost me. I let them know my decision and so far their response has been silence. I was interested in the Social Security info and I got it. Most of it was not useful to me because of my situation – oh well. But then the “weekly” newsletters started – up to two a day. Mostly like AOL with a teaser to get you to click on the link. What are you 2nd graders? Tell us what you have and we will decide if it is for us and click or not. Most of everything is fluff, trying to hype you up to buy a product. I was in sales for 20 years and it is amusing to watch them try make everything look like diamonds surrounded by cotton stuffing. I got a 10 page email – 3 pages was how this guy started out poor, worked a job, made his first stock buy… who cares! The whole point of the 10 page email didn’t come until page 9 – the first 8 pages were wasted time. Their videos are worse: 5 minutes in they say “We have a great strategy for you, but we are not going to tell you what it is yet!” and that happens 3 or 4 times so a half hour later you still don’t know what the strategy is. I did not join to invest so I can’t speak as to their advice but if you have an hour or two to waste on fluff every day – sign up. few good ideas repeated over and over and over and over.. If you like to hear rich guys talk about how they got rich and how you should do it too, this is the service for you. The ‘Current Income’ product can illustrate a (relatively) conservative way to make money trading options, but the rest of the service is just average advice. 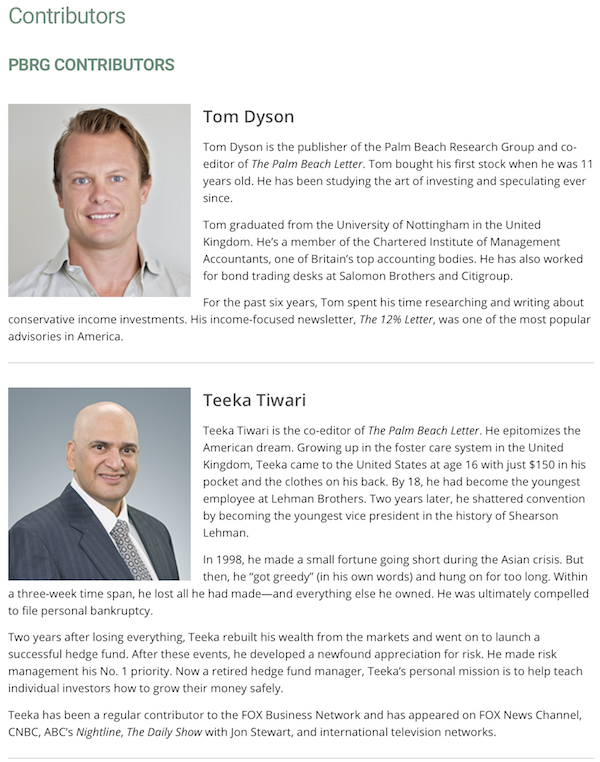 The stock picking of Teeka Tiwari and Tom Dyson is as effective as anybody else’s – but no better. The retirement advisor Bob Irish is full of good advice, but so’s my golf buddy Mike. All that coupled with a price that could choke a horse make this a stay-away website – be careful! These guys are rich for a reason, and it’s not because they’re excellent investors. Palm Beach Confidential is great! I’m basing my review solely on my experience with the Palm Beach Confidential Newsletters, by Teeka Tiwari. I’ve been a subscriber now for a few months, and the newsletters are short and straight to the point. In February, Teeka said to buy NEO (before I was a member), and it’s gone up from 15 cents to as high as $49.00 – a 37,000% or so return. I DID buy OMG and a few others when he said, and on AVERAGE now my portfolio with him has increased by 2,500%. So my $0.02 – this is based on the newsletter only, not the rest of the company. I asked the second agent why PBRG wouldn’t just follow up on its own in several days (after the charge had cleared its pending status), instead of making me go thru the steps to RE-REQUEST what I had made perfectly clear during my first call — “I want to cancel, and to receive a refund for the $129 charge at the beginning of the second year.” I suggested to the second agent that she forward my recorded comments in my conversation with her, to her management team, so they can hopefully tighten up this currently sloppy aspect of their cancellation process, which has rendered me a dissatisfied Customer. I wonder how many others may have experienced the same response, including perhaps NOT BEING REFUNDED AT ALL (i.e., the refund issue being “out of sight, out of mind”). Not Best Practices, by any stretch. If I am contacted by PBRG with a confirmation that they have indeed effectively changed their practices to eliminate this process defect, then I will consider revisiting this critique, and perhaps changing my overall (currently very low) rating of their company. Otherwise, I would recommend you steer clear of PBRG.